What do you get when almost 10,000 automotive product manufacturers and over 120,000 people collect into millions of square feet of convention center space? Back in 1965, underneath the bleachers of Dodger Stadium in the bitter cold, the very first SEMA Show took place. It was there that a small collection of automotive talent gathered to discuss trends, new products, and the future of the automotive industry. I doubt they had any idea what they had just started. Almost 40 years have passed since that night, and the SEMA Show phenomenon has exploded into the biggest trade show of its kind in the world. SEMA is the Specialty Equipment Market Association. 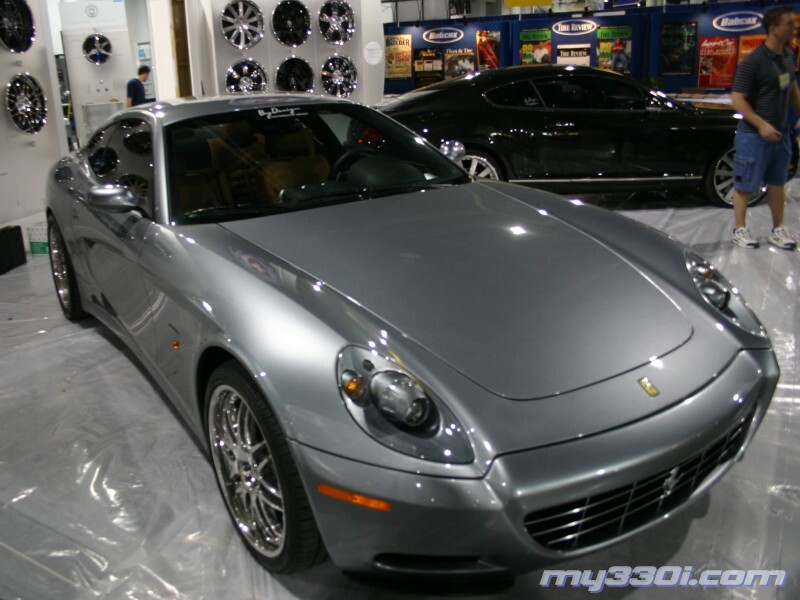 Its major members include well-known manufacturers such as General Motors, Ford, Toyota, Honda, and Daimler/Chrysler (Dodge). 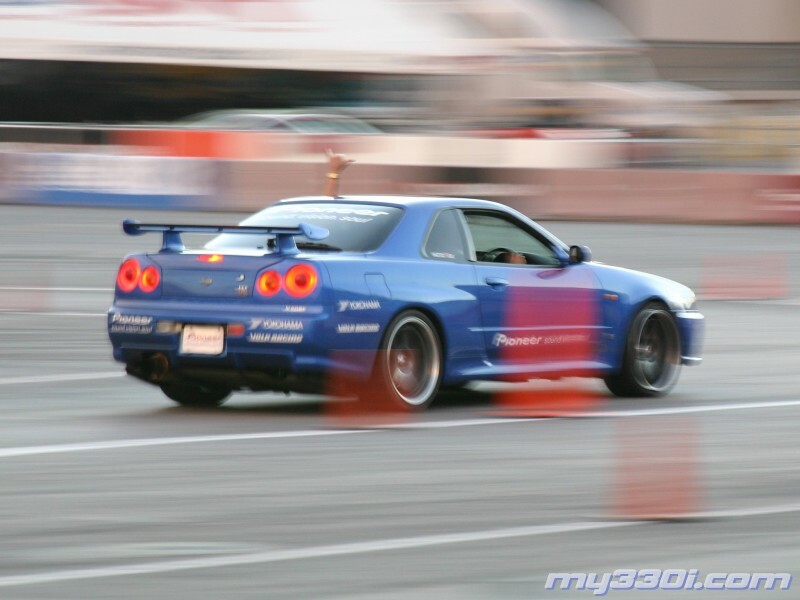 The association exists to bring aftermarket companies such as Bilstein, Borla, Hypertech, Sparco, 3M, and buyers together to connect and trade thoughts in a profitable business environment with the manufacturers and other suppliers. All in one place at one time. 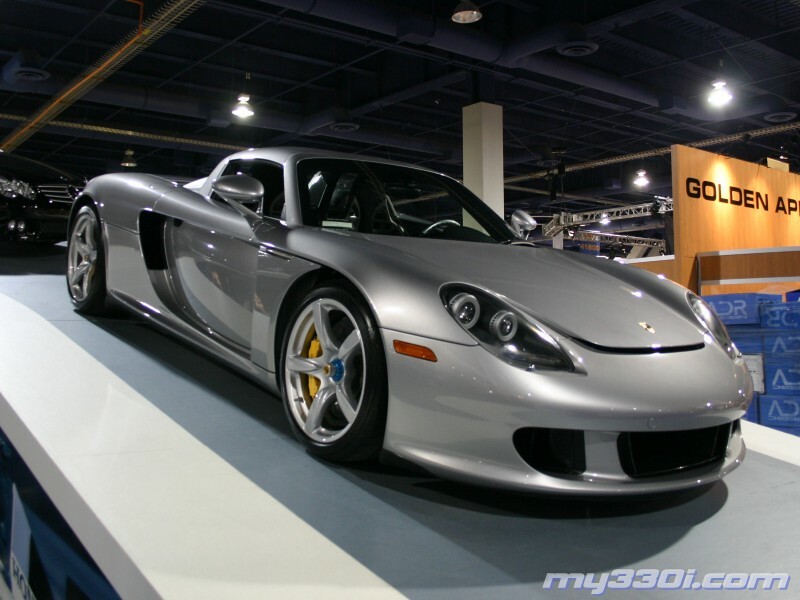 Not long after the realization that SEMA was quickly growing, the venue location changed to Las Vegas, Nevada. With ample room accomodations and lots to do after the show, it is the perfect setting for this massive event. Held each year during the first week in November, the SEMA Show is part of the AAIW (Automotive Aftermarket Industry Week) and is the largest of three shows occuring at the same time. The other two (AAPEX and NACE) involve smaller segments of the business such as fasteners, collision center materials and tools, and other small bits. 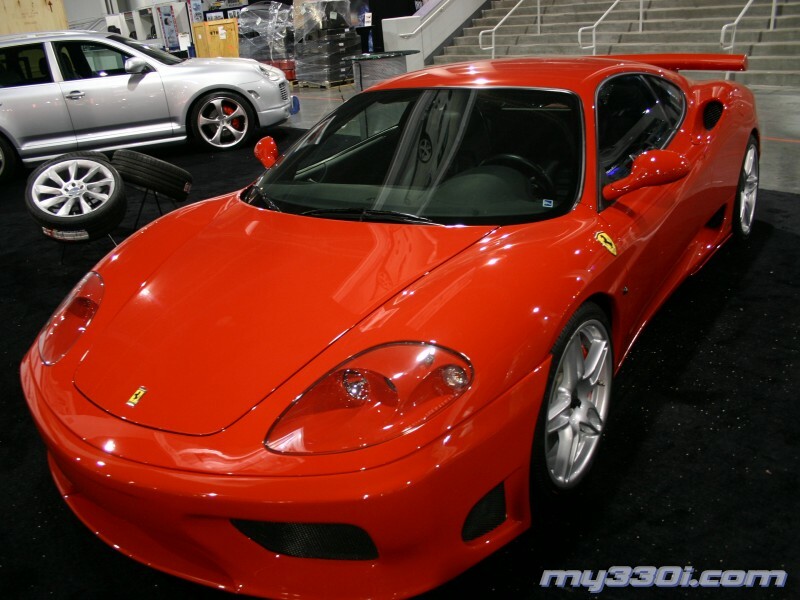 SEMA easily dwarfs these other venues, but they are just as important to the industry. My attendance this year will mark my third consecutive trip to the SEMA Show. The first time you go, you realize how important a very comfortable pair of walking shoes are. To see every booth, you will walk well over 20 miles. I even saw people on Segways! It simply cannot be reasonably seen in a single day. Luckily, SEMA lasts all day from Tuesday to Friday. 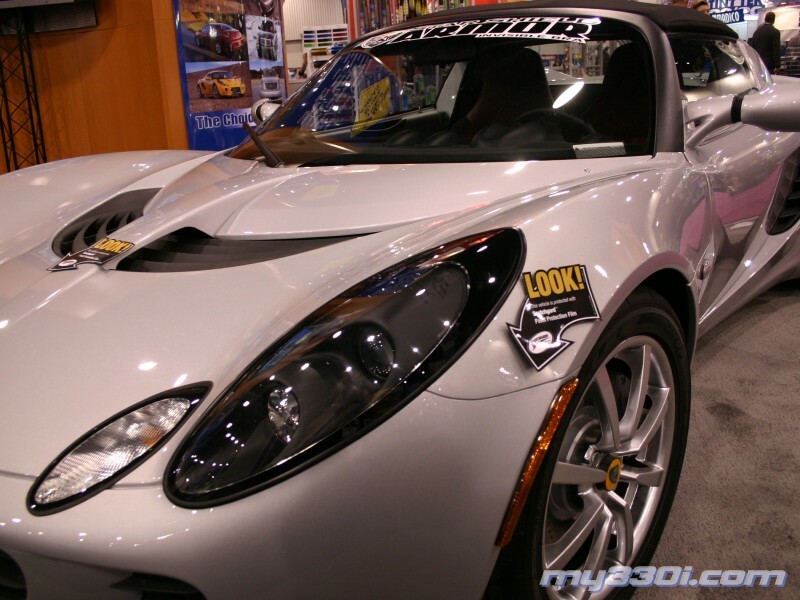 The following photographs were courtesy of our Jeff Beck who enjoyed his first time at SEMA. Special thanks go out to him for his contribution! 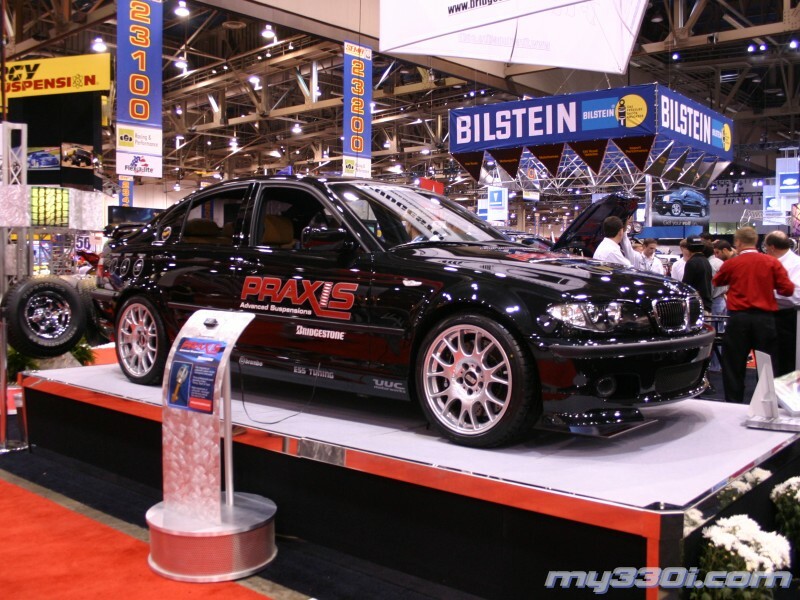 This year also marks the first time a my330i.com Project Car was displayed in the show. What an experience! We got into Las Vegas Sunday night before the show. I drove the car into the Racing & Performance section of the main hall on Monday morning. Setup takes all day in order to be ready for the public on Tuesday. It is amazing how fast the setup and teardown is. These are pictures of the setup day. The cars were loaded onto platforms in the Bridgestone/Firestone/Praxis booth. The other car in our booth was EvoSport's M3 Coupe with the M Kompressor aftercooled system. 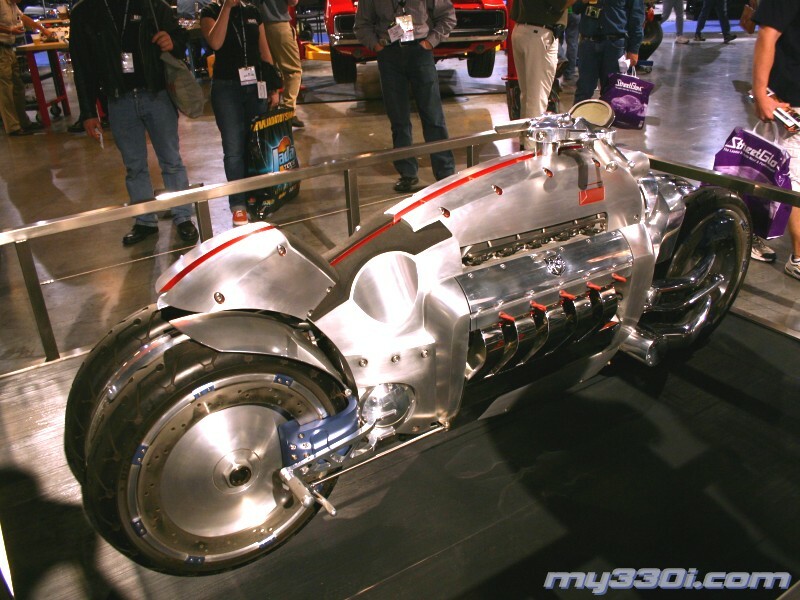 It reportedly puts over 600hp to the wheels on the nitrous bottle. It really is insane and a wonderful machine. 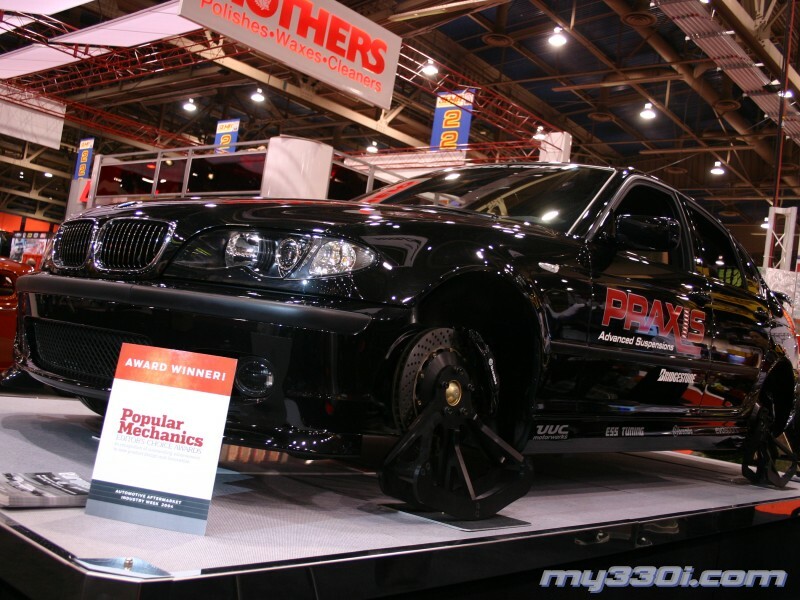 On the opposite end of the booth, the my330i.com Project Car was setup and the wheels removed on the driver's side. 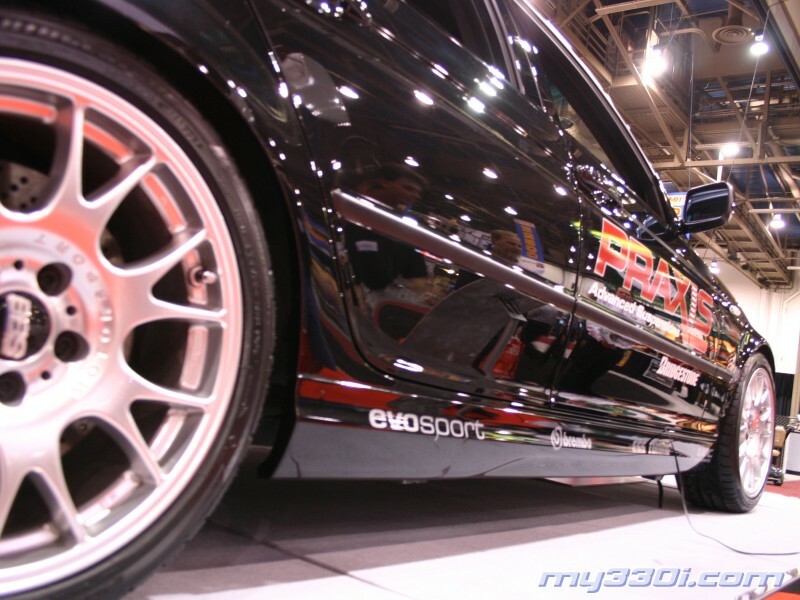 Praxis had custom stands made to support the car and allow the wheels to roll a bit during demonstrations of the Praxis Advanced Suspension system. Unfortunately, they didn't compensate for the Brembo GT kit up front and I had to remove the caliper and zip tie it higher up on the rotor. I don't think anyone noticed my little adjustment, but it allowed full movement of the suspension. We ran power and air into the car from underneath the display, but it turns out the supplied compressed air pressure was not high enough. We finally let the system run on its own compressor and supplied 12v from a outside power supply. At times, this meant for waits between all the pushes of an external controller unit by the eager public for the suspension to make changes between modes. All in all, the booth display was a success and received a lot of attention. 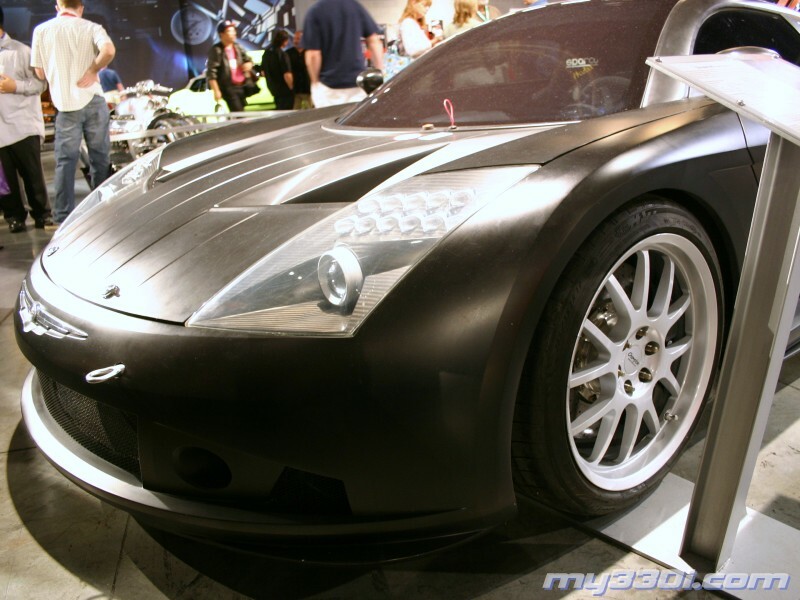 Other vehicles made a big splash at SEMA 2004. 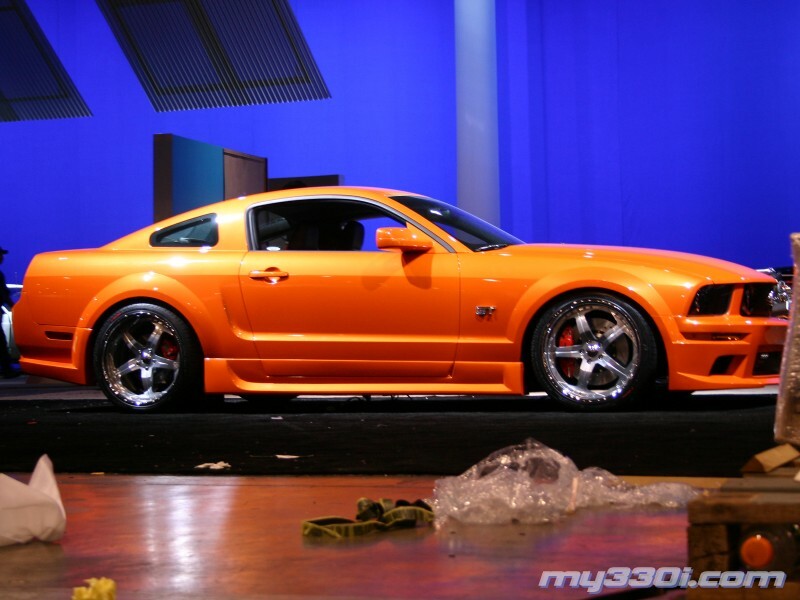 It was the most immense collection of the New 2005 Ford Mustang shown as of yet. 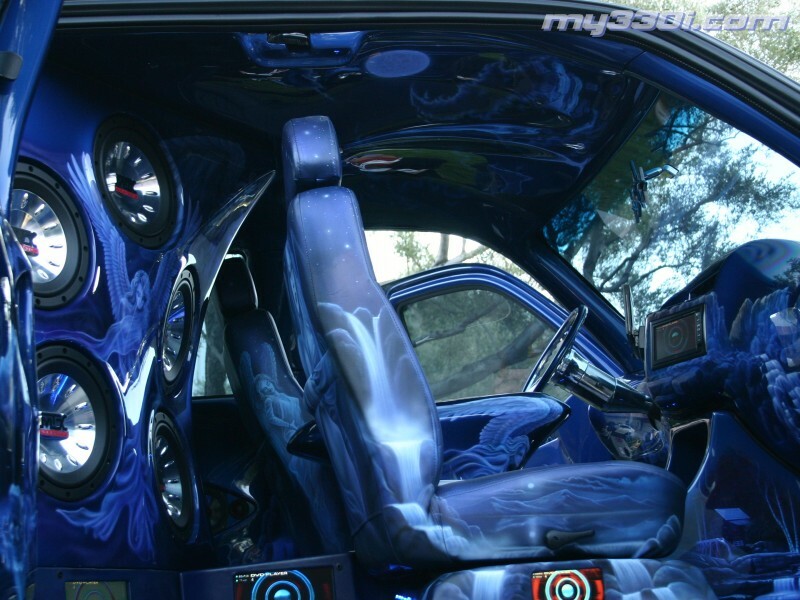 Mustangs from every Ford-related tuning company were on display such as Saleen, Shelby, H&R, SVT, and more. I am not a Ford guy, but they really got something good going with this new design. I think it will be very successful especially for the price and power. THE Work of Art: The HEROES Chevrolet parked outside the main hall. 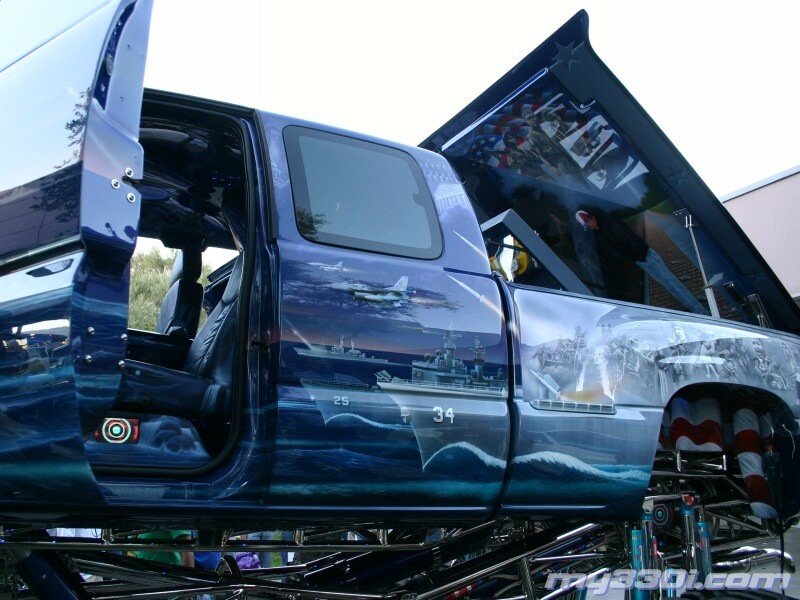 This truck was by far the most beautiful piece of work at the show in my opinion. It took 4 years to complete. 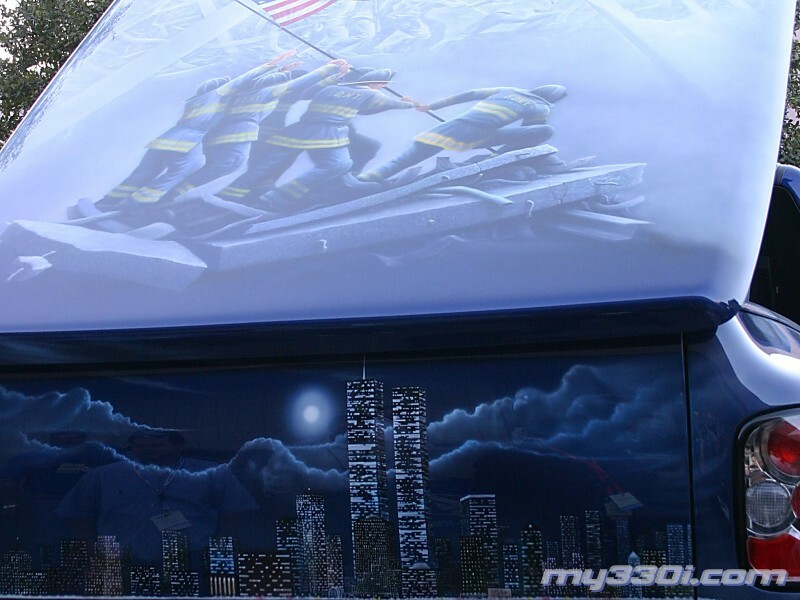 The paint is by Mickey Harris and it shows the true strength of America. 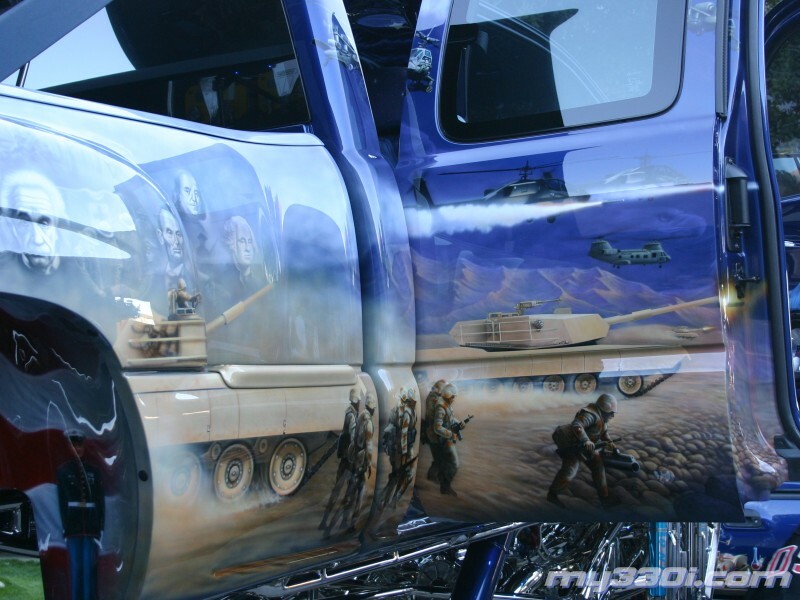 From the various armed forces, the Presidents, the greatest minds in history, and the strongest symbols of American pride and willpower, this vehicle's paint and airbrush work was simply breathtaking. An ingenious scissor-lift system is able to hydraulically pivot the body off the custom tube frame exposing the massive 540 cubic inch supercharged big block and transmission. And of course, it is all completely chromed. Even the rear differential cover is chrome and embossed with an eagle's head. This fuel-injected monster can make over 3,000 horsepower, but is tuned down to a "measely" 1,200 for daily driving. A full load of video electronics and MTX audio round out the package and was playing "God Bless America" and other patriotic themes throughout the day. This thing was beyond great! By the end of the 4-day run, it felt like we had walked to the moon and back, ate more buffets and miscellaneous junk food than we could manage, and partied and gambled deep into the following mornings. SEMA has a somewhat lesser known very active nightlife and aftershow parties & manufacturer bashes occur every evening. It is all an experience everyone should enjoy at least once. SEMA 2005 is November 1-4, 2005 at the Las Vegas Convention Center, Las Vegas, NV.